Jun “TY” Tae Yang doesn’t have the illustrious career of many other StarCraft pros. Despite playing the game for a decade, since the age of 12, Jun had never won a premier event until January. Today, at Intel Extreme Masters Katowice, Jun took his second-ever first place finish at a premier, besting the top player in the world to do so. In the group stages, Jun finished third, directly below his future grand finals opponent Kim “Stats” Dae Yeob. Kim is currently ranked number one in the StarCraft II World Championship Series rankings, while Jun came into the tournament at rank 10. The two met in the group stage once, with Kim emerging victorious 2-1. Now in the grand finals, Jun would have to overcome some demons in order to beat one of the best in the world. It was a back-and-forth affair, with one player never being more than a single match ahead of the other in the best-of-seven grand finals. Jun would execute brilliant raids on Kim’s base, utilizing the Terran faction’s arsenal of dropships and marines to demolish Kim’s economy. Kim would fire back, employing the Protoss’ raw power and versatile skill set to adapt to Jun’s army composition on the fly. In one game, Kim executed a rush on Jun, permanently crippling his early economy and forcing a surrender, and then Jun would fire back in the next game. The series came to a head at 3-3, with just one map determining the victor. The climactic game seven took place on a map called Cactus Valley, a larger map with plenty of expansion sites. It looked like the finale might turn into a long war, but Jun rushed for a surprise unit to add to his army: a Raven, a scouting ship that can deploy automated turrets and detect invisible units. Building up his forces, Jun crafted just the right composition of tanks, marines and air forces to push out against Kim’s still-developing army, and struck at just the right time to secure the win, 4-3. 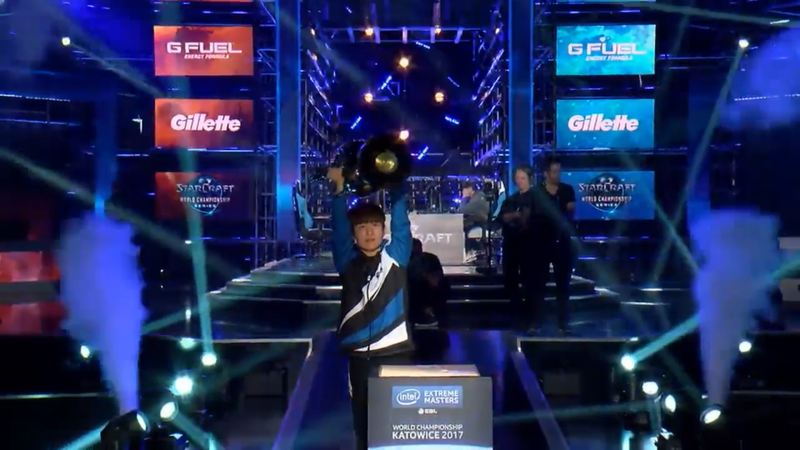 Jun’s victory at Intel Extreme Masters Katowice not only secures him $100,300 in prize money, but bumps him up to the number three spot in the world rankings and secures him a seat at BlizzCon this fall for the World Championship Series finals. A decade of work and determination paid off, and as Jun said in his post-game interview, it looks like 2017 might be the year of TY. IEM Katowice is sponsored in part by Gillette, an advertising partner of Compete. Editorial decisions and coverage is not directed nor driven by advertising partnership.